What comes Next? You may have seen these kind of puzzles in which series of numbers or letters is given. This series contains certain pattern which determines the next number in the series. 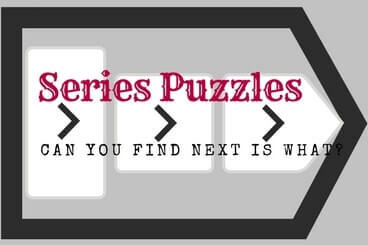 Your challenge in these series puzzles is to find these mathematical or logical patterns and then find the next few missing numbers in the series. Most of the times the series puzzles are with numbers but some times there is series of letters or combinations of letters and numbers. Here is list of few Series Puzzles which are present on this website. Do click on the links given below to open corresponding puzzles. What is Next Number In The Sequence?